The Austrian Empire stamps of 1867 to 1883 form the core of many specialized classical Austria stamp collections. Most of these classical Austrian stamps are relatively inexpensive (in used condition), they are attractive, and they offer an incredible array of collecting possibilities. One can begin with getting one of each of the stamps issued during this period, then the simple collection can be expanded to collecting shades, varieties, watermarks, perforation types, covers, proofs, and let us not forget, the postmarks of the thousands of post offices that existed throughout the Austrian Empire during this time period. Before the Austro-Hungarian Compromise of 1867, the Austrian Empire was an absolute monarchy, which included Hungary, Eastern Europe, the Balkans, and Northern Italy. In 1867, the Austro-Hungarian Monarchy was established. Hungary became a self-governing monarchy, with its own parliament and Franz Josef I as its king. From this time, the Austrian Empire and the Kingdom of Hungary were equal partners. The new series of definitive postage stamps, introduced in 1867, were valid for postage in both Austria and its possessions and the Kingdom of Hungary and its possessions. In 1871, the independent postal administration of the Kingdom of Hungary began to issue its own postage stamps. From that time, the Austrian Empire postage stamp issues were no longer valid within the Kingdom of Hungary and its possessions. 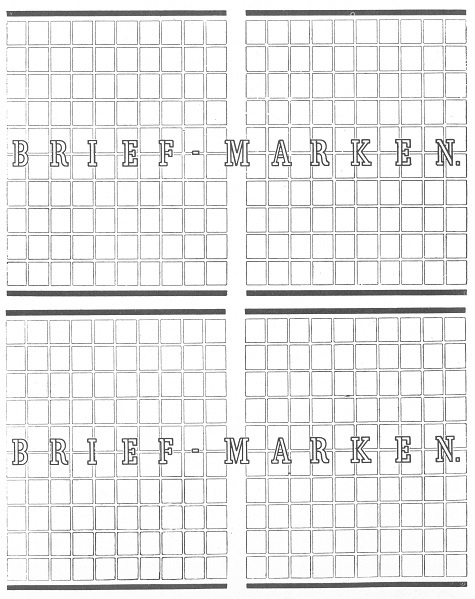 The use of the "BRIEF-MARKEN" press-sheet watermark continued throughout this period. Please see the article to the right. 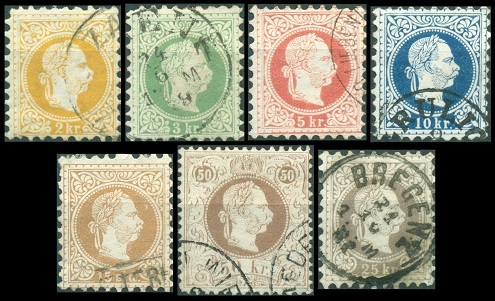 Designs similar to the issues of 1867 to 1883 were also issued for use by Austrian Empire post offices in the Turkish Empire, but they are all denominated in Soldi (Sld. ), instead of Kreuzer (Kr.). The seven Austrian Empire "Coarse Printing" portrait definitive stamps shown above were issued during 1867. These stamps are typographed. The common design features the right-facing portrait of Emperor Franz Josef I. The only inscription on these Austrian Empire stamps is that of the denomination, which is located at the bottom of the stamp. The Michel / Scott catalog attributes, for Coarse Printing stamps that are perforated 9 1/2 (02 K. - 25 K.) or perforated 12 (50 K.), are as follows. The shades used in the table are from the Michel catalog. 02 K. (1867 - Mi. #35I, Sc. #27) - Yellow, Ocher, Orange, Dark Orange, Brownish Orange. 03 K. (1867 - Mi. #36I, Sc. #28) - Green, Dark Green. 05 K. (1867 - Mi. #37I, Sc. #29) - Pale Carmine, Rose Carmine, Carmine, Lilac Rose, Violet Red, Brick Red. 10 K. (1867 - Mi. #38I, Sc. #30) - Blue, Dark Blue, Light Blue. 15 K. (1867 - Mi. #39I, Sc. #31) - Brown, Dark Brown, Black Brown, Yellowish Brown, Gray Brown, Reddish Brown. 25 K. (1867 - Mi. #40I, Sc. #32) - Gray, Grayish Lilac, Lilac, Dark Lilac, Violet, Brownish Lilac, Violet Brown. 50 K. (1867 - Mi. #41I, Sc. #33) - Brown, Reddish Brown, Brownish Rose. 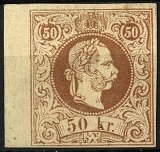 One of the rarest of all Austrian Empire stamps is shown in the image above (Mi. #36F, Sc. #29c). This famous error occurred, when a 3 Kr. cliché was inserted by mistake into a 5 Kr. printing plate, resulting in this 3 Kr. denomination stamp being printed in red, instead of green. The stamp shown in the image above is from a 2016 David Feldman S.A. auction. It is postmarked BECSKEREK (Kingdom of Hungary) on January 1 (probably 1868). The six known examples of this stamp (two covers, one stamp on piece, and three single stamps) were all used in the historical Banat Region of the Austro-Hungarian Empire, encompassing portions of modern-day Hungary, Romania, and Serbia. The major differences between the coarse and fine printings of these Austrian Empire stamps are rather obvious. There are also two major types of the 5 Kr. denomination stamps, having to do with the ornaments in the lower-left corner. They are valued about the same in the major catalogs. For those that wish to see the detailed descriptions, please refer to the major catalogs. 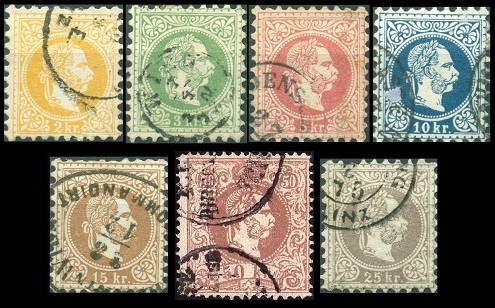 The seven Austrian Empire "Fine Printing" portrait definitive stamps shown above were issued between 1874 and 1880. These stamps are typographed, and they have many different perforation gauges. The Michel / Scott catalog attributes, for Fine Printing stamps that are perforated 9 1/2, are as follows. The shades used in the table are from the Michel catalog. 02 K. (1876 - Mi. #35II, Sc. #34) - Yellow, Lemon Yellow. 03 K. (1876 - Mi. #36II, Sc. #35) - Light Green, Yellowish Green, Bluish Green. 05 K. (1874 - Mi. #37II, Sc. #36) - Red. 10 K. (1875 - Mi. #38II, Sc. #37) - Blue, Dark Blue, Light Blue. 15 K. (1877 - Mi. #39II, Sc. #38) - Yellow Brown, Gray Brown, Reddish Brown, Chestnut Brown. 25 K. (1878 - Mi. #40II, Sc. #39) - Lilac Gray, Gray Violet. 50 K. (1878 - Mi. #41II, Sc. #40) - Brown. The Michel / Scott catalog attributes, for Fine Printing stamps that are perforated 9, are as follows. 02 K. (1876 - Mi. #35IIB, Sc. #34a) - Yellow, Lemon Yellow. 03 K. (1876 - Mi. #36IIB, Sc. #35a) - Light Green, Yellowish Green, Bluish Green. 05 K. (1874 - Mi. #37IIB, Sc. #36a) - Red. 10 K. (1875 - Mi. #38IIB, Sc. #37a) - Blue, Dark Blue, Light Blue. 15 K. (1877 - Mi. #39IIB, Sc. #38a) - Yellow Brown, Gray Brown, Reddish Brown, Chestnut Brown. The Michel / Scott catalog attributes, for Fine Printing stamps that are perforated 10 1/2, are as follows. 02 K. (1876 - Mi. #35IIC, Sc. #34b) - Yellow, Lemon Yellow. 03 K. (1876 - Mi. #36IIC, Sc. #35b) - Light Green, Yellowish Green, Bluish Green. 05 K. (1874 - Mi. #37IIC, Sc. #36b) - Red. 10 K. (1875 - Mi. #38IIC, Sc. #37b) - Blue, Dark Blue, Light Blue. 15 K. (1877 - Mi. #39IIC, Sc. #38b) - Yellow Brown, Gray Brown, Reddish Brown, Chestnut Brown. The Michel / Scott catalog attributes, for Fine Printing stamps that are perforated 12, are as follows. 02 K. (1876 - Mi. #35IID, Sc. #34c) - Yellow, Lemon Yellow. 03 K. (1876 - Mi. #36IID, Sc. #35c) - Light Green, Yellowish Green, Bluish Green. 05 K. (1874 - Mi. #37IID, Sc. #36c) - Red. 10 K. (1875 - Mi. #38IID, Sc. #37c) - Blue, Dark Blue, Light Blue. 15 K. (1877 - Mi. #39IID, Sc. #38c) - Yellow Brown, Gray Brown, Reddish Brown, Chestnut Brown. 50 K. (1880 - Mi. #41IID, Sc. #40b) - Brown. The Michel / Scott catalog attributes, for Fine Printing stamps that are perforated 13, are as follows. 02 K. (1876 - Mi. #35IIE, Sc. #34d) - Yellow, Lemon Yellow. 03 K. (1876 - Mi. #36IIE, Sc. #35d) - Light Green, Yellowish Green, Bluish Green. 05 K. (1874 - Mi. #37IIE, Sc. #36d) - Red. 10 K. (1875 - Mi. #38IIE, Sc. #37d) - Blue, Dark Blue, Light Blue. 15 K. (1877 - Mi. #39IIE, Sc. #38d) - Yellow Brown, Gray Brown, Reddish Brown, Chestnut Brown. 50 K. (1874 - Mi. #41IIE, Sc. #40a) - Brown. The Michel / Scott catalog attributes, for Fine Printing stamps that are perforated 9 x 10 1/2, are as follows. 02 K. (1876 - Mi. #35IIF, Sc. #34e) - Yellow, Lemon Yellow. 03 K. (1876 - Mi. #36IIF, Sc. #35e) - Light Green, Yellowish Green, Bluish Green. 05 K. (1874 - Mi. #37IIF, Sc. #36e) - Red. 10 K. (1875 - Mi. #38IIF, Sc. #37e) - Blue, Dark Blue, Light Blue. The Michel / Scott catalog attributes, for Fine Printing stamps that are perforated 9 x 12, are as follows. 05 K. (1874 - Mi. #37IIG, Sc. N/L) - Red. The Michel / Scott catalog attributes, for Fine Printing stamps that are perforated 9 x 13, are as follows. 02 K. (1876 - Mi. #35IIH, Sc. N/L) - Yellow, Lemon Yellow. 05 K. (1874 - Mi. #37IIH, Sc. N/L) - Red. The Michel / Scott catalog attributes, for Fine Printing stamps that are perforated 10 1/2 x 9, are as follows. 02 K. (1876 - Mi. #35IIJ, Sc. N/L) - Yellow, Lemon Yellow. 03 K. (1876 - Mi. #36IIJ, Sc. N/L) - Light Green, Yellowish Green, Bluish Green. 05 K. (1874 - Mi. #37IIJ, Sc. N/L) - Red. 10 K. (1875 - Mi. #38IIJ, Sc. N/L) - Blue, Dark Blue, Light Blue. 15 K. (1877 - Mi. #39IIJ, Sc. N/L) - Yellow Brown, Gray Brown, Reddish Brown, Chestnut Brown. The Michel / Scott catalog attributes, for Fine Printing stamps that are perforated 10 1/2 x 12, are as follows. 02 K. (1876 - Mi. #35IIK, Sc. N/L) - Yellow, Lemon Yellow. 03 K. (1876 - Mi. #36IIK, Sc. N/L) - Light Green, Yellowish Green, Bluish Green. 05 K. (1874 - Mi. #37IIK, Sc. N/L) - Red. 10 K. (1875 - Mi. #38IIK, Sc. N/L) - Blue, Dark Blue, Light Blue. 50 K. (1874 - Mi. #41IIK, Sc. N/L) - Brown. The Michel / Scott catalog attributes, for Fine Printing stamps that are perforated 10 1/2 x 13, are as follows. 02 K. (1876 - Mi. #35IIL, Sc. N/L) - Yellow, Lemon Yellow. 05 K. (1874 - Mi. #37IIL, Sc. N/L) - Red. 10 K. (1875 - Mi. #38IIL, Sc. N/L) - Blue, Dark Blue, Light Blue. The Michel / Scott catalog attributes, for Fine Printing stamps that are perforated 12 x 10 1/2, are as follows. 05 K. (1874 - Mi. #37IIM, Sc. N/L) - Red. 10 K. (1875 - Mi. #38IIM, Sc. N/L) - Blue, Dark Blue, Light Blue. The Michel / Scott catalog attributes, for Fine Printing stamps that are perforated 12 x 13, are as follows. 05 K. (1874 - Mi. #37IIN, Sc. N/L) - Red. 10 K. (1875 - Mi. #38IIN, Sc. N/L) - Blue, Dark Blue, Light Blue. The Michel / Scott catalog attributes, for Fine Printing stamps that are perforated 13 x 10 1/2, are as follows. 05 K. (1874 - Mi. #37IIO, Sc. N/L) - Red. 10 K. (1875 - Mi. #38IIO, Sc. N/L) - Blue, Dark Blue, Light Blue. The Michel / Scott catalog attributes, for Fine Printing stamps that are perforated 13 x 12, are as follows. 03 K. (1876 - Mi. #36IIP, Sc. N/L) - Light Green, Yellowish Green, Bluish Green. 05 K. (1874 - Mi. #37IIP, Sc. N/L) - Red. 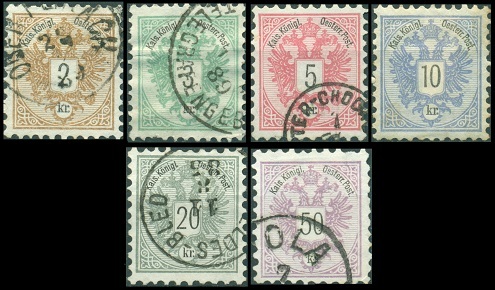 The six Austrian Empire definitive stamps shown above were first issued in August 1883, with additional printings continuing through 1890. These stamps are typographed, and they have a wide range of perforation gauges. The common design features the Austrian Empire Coat of Arms. These Austrian Empire stamps have black inscriptions, with the frames printed in various colors. The Michel / Scott catalog attributes, for stamps that are perforated 9 1/2, are as follows. The frame colors used in the table are from the Michel catalog. 02 K. (1883 - Mi. #44A, Sc. #41) - Ocher Brown. 03 K. (1883 - Mi. #45A, Sc. #42) - Green. 05 K. (1883 - Mi. #46A, Sc. #43) - Lilac Red. 10 K. (1883 - Mi. #47A, Sc. #44) - Violet Ultramarine. 20 K. (1883 - Mi. #48A, Sc. #45) - Olive Gray. 50 K. (1883 - Mi. #49A, Sc. #46) - Violet Brown, Brown Lilac. The Michel / Scott catalog attributes, for stamps that are perforated 10, are as follows. 02 K. (1887 - Mi. #44B, Sc. #41) - Ocher Brown. 03 K. (1887 - Mi. #45B, Sc. #42) - Green. 05 K. (1887 - Mi. #46B, Sc. #43) - Lilac Red. 10 K. (1887 - Mi. #47B, Sc. #44) - Violet Ultramarine. 20 K. (1887 - Mi. #48B, Sc. #45) - Olive Gray. 50 K. (1887 - Mi. #49B, Sc. #46) - Violet Brown, Brown Lilac. The Michel / Scott catalog attributes, for stamps that are perforated 9, are as follows. 02 K. (1883 - Mi. #44C, Sc. #41) - Ocher Brown. 03 K. (1883 - Mi. #45C, Sc. #42) - Green. 05 K. (1883 - Mi. #46C, Sc. #43) - Lilac Red. 10 K. (1883 - Mi. #47C, Sc. #44) - Violet Ultramarine. 20 K. (1883 - Mi. #48C, Sc. #45) - Olive Gray. 02 K. (1883 - Mi. #44D, Sc. #41) - Ocher Brown. 03 K. (1883 - Mi. #45D, Sc. #42) - Green. 05 K. (1883 - Mi. #46D, Sc. #43) - Lilac Red. 10 K. (1883 - Mi. #47D, Sc. #44) - Violet Ultramarine. 20 K. (1883 - Mi. #48D, Sc. #45) - Olive Gray. 02 K. (1890 - Mi. #44E, Sc. #41) - Ocher Brown. 03 K. (1890 - Mi. #45E, Sc. #42) - Green. 05 K. (1890 - Mi. #46E, Sc. #43) - Lilac Red. 10 K. (1890 - Mi. #47E, Sc. #44) - Violet Ultramarine. 02 K. (1890 - Mi. #44F, Sc. #41) - Ocher Brown. 03 K. (1890 - Mi. #45F, Sc. #42) - Green. 05 K. (1890 - Mi. #46F, Sc. #43) - Lilac Red. 10 K. (1890 - Mi. #47F, Sc. #44) - Violet Ultramarine. 02 K. (1890 - Mi. #44G, Sc. #41) - Ocher Brown. 03 K. (1890 - Mi. #45G, Sc. #42) - Green. 05 K. (1890 - Mi. #46G, Sc. #43) - Lilac Red. 10 K. (1890 - Mi. #47G, Sc. #44) - Violet Ultramarine. The Michel catalog lists compound perforation prices for the 02 K., 03 K., 05 K., and 10 K. denomination stamps, but they do not assign separate catalog numbers to the different perforation gauges. There are fourteen varieties of compound perforation gauges mentioned in the Michel catalog. These stamps are scarce and rather expensive. Some of the final printings of these Austrian Empire stamps are printed on paper with the "ZEITUNGS-MARKEN" press-sheet watermark, intended for newspaper stamps, instead of the "BRIEF-MARKEN" press-sheet watermark. Austrian Empire definitive stamps that show convincing evidence of the ZEITUNGS-MARKEN watermark are valued at much more than the same stamps having evidence of the BRIEF-MARKEN watermark. Beginning in July 1864, the paper used to print Austrian stamps was watermarked "BRIEF-MARKEN", in double-lined capitals, across the middle of the two horizontal panes of each press-sheet. The letters are very large, and presuming proper alignment, the portions of the letters appear on between eighteen or twenty horizontal positions of each pane of stamps. Of course, the location of the paper watermark can be variable, up, down, left, or right, depending on how the paper was aligned on the printing plate. Though it is understood that the panes of stamps were "watermarked", in reality, eighty or more of the horizontal positions on each of the panes (80% or more) will be "unwatermarked"! Stamps showing portions of the watermark letters are scarce, and they are in high demand! They are valued at considerably more than the same stamps that do not show any watermark. The two Austrian Empire newspaper stamps shown above were first issued in 1867 and 1876. These newspaper stamps are typographed, and they are both imperforate. The design features a left-facing profile of Mercury, the Ancient Roman "Messenger of the Gods". These newspaper stamps were printed in Lilac, Gray Lilac, Lilac Brown, Gray, Violet, Gray Violet, Deep Violet, Blackish Violet, and Reddish Violet. The stamp shown above, at the top (Mi. #42I, Sc. #P9), is the Coarse Printing. The stamp shown above, at the bottom (Mi. #42II, Sc. #P9B), is the Fine Printing. There are four major types of these stamps. For description details, please refer to the major catalogs. These newspaper stamps have a "ZEITUNGS-MARKEN" press-sheet watermark, spanning twenty horizontal positions in the middle of each pane. The 1/2 Kr. Austrian Empire newspaper stamp shown above was issued on December 1, 1880. The design is very similar to the previous issue. These newspaper stamps were printed in Blue Green, Yellow Green, Gray Green, and Emerald Green.